How much stuff can you put in a minivan? Well, let’s see. First we’ll just fold down the rear seats, like this. . . .
No! How much stuff—as in features—can you put in a minivan? Honda aims to find out with its Odyssey, which is wholly redone for 2018. 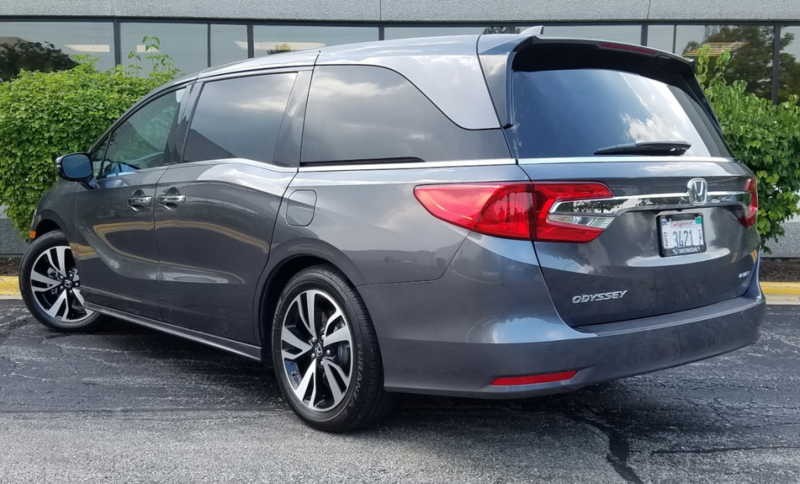 The 2018 Odyssey’s styling carries over the “lightning bolt” stepped beltline; the sliding side-door tracks are now concealed by the window glass. The Elite model comes standard with 19-inch alloy wheels. The restyled and re-engineered Odyssey comes in a pared-down lineup of LX, EX, EX-L (with or without navigation and rear entertainment system), Touring, and Elite models. Gone is the SE formerly found between the EX and EX-L. Per Honda custom, there are no individual options, so feature availability builds trim level by trim level until you reach the fully loaded top. It was one of the all-inclusive Elites that Consumer Guide® editors had the opportunity to test. What that buys for a considerable $47,610 (including the $940 destination fee) are trick new features like “Magic Slide” second-row seats, the CabinTalk/CabinWatch/CabinControl trio of remote-monitoring capabilities, 4G LTE Wi-Fi, a 10-speed automatic transmission, liberal use of acoustic glass and other sound-squelching materials, rain-sensing windshield wipers, wireless device charging, ventilated front seats, a heated steering wheel, and a hands-free power tailgate. The Elite possesses luxuries like leather-upholstered seats, 12-way power-adjustable driver’s seat with memory settings, an 11-speaker audio system, HD and satellite radio, Blu-ray/DVD rear entertainment system with wireless headphones, tri-zone automatic climate control, built-in vacuum cleaner, and power moonroof. Technology and safety items include an improved display screen for audio, navigation, and apps; Apple CarPlay and Android Auto integration; HondaLink telematics; Bluetooth hands-free phone capability; push-button starting; blind-spot and rear cross-traffic monitors; adaptive cruise control; collision-mitigating braking; lane-departure warning; lane-keeping assist; and road-departure mitigation. The Odyssey cabin is spacious and comfortable in all three rows of seating. The top-line Elite boasts high-end interior materials throughout, though the ambiance is more about understated functionality than posh luxury. A number of these features are included in Odysseys further down the price ladder. Some are similar to or alternatives for things found in competing minivans. Magic Slide is the latest idea in the never-ending quest for minivan-interior utility. The second-row captain’s chairs can be manually moved laterally—as well as fore or aft—to improve access to the third row. (A middle seat can be placed between them for 3-abreast seating that increases passenger capacity to eight.) In the Elite, CabinTalk lets the driver talk to rear-seat passengers through the second- and third-row speakers. CabinWatch utilizes a ceiling-mounted camera to observe what’s happening in rearward seats; infrared capability makes this possible in the dark. CabinControl is a smartphone app that lets back-seat occupants control climate functions and the rear entertainment system, and upload destinations to the navigation system. 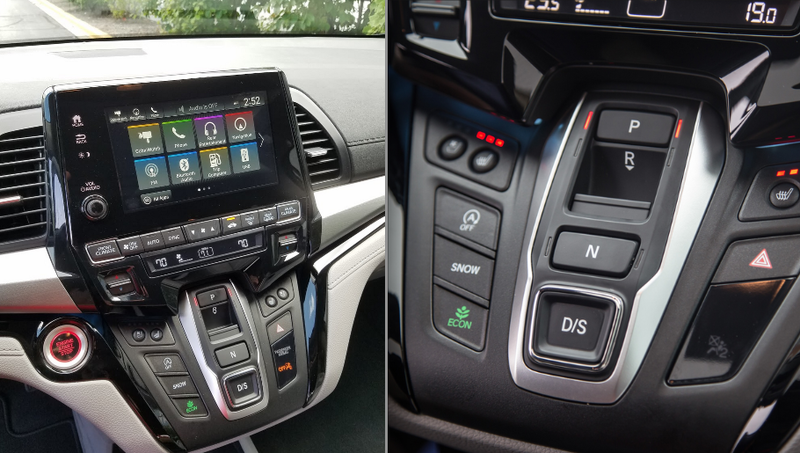 The Odyssey’s all-new infotainment system is a strong point; the virtual buttons are very large and easy to use while driving, and the button layout can be re-arranged to fit the driver’s preference. The push-button gear selector takes a bit of getting used to, but it became second nature for most of our testers. Room and seating comfort are excellent throughout, even in the third row, where two adults (or three kids) will fit with a natural seating position and headroom that’s not too bad. Front seats have thoughtful inboard flipper-type armrests, and middle-row seats have these on both sides. The same attention that Honda gives to enabling good driver vision in its sedans and coupes also appears in the Odyssey—though if third-row headrests are left in the full-up position they will obstruct the straight-back view. Elite interior materials look and feel plush—soft-touch material is well distributed across the dashboard and doors. Instruments are actually styled, with vee’d coolant-temperature and fuel-level gauges at the far ends linked at the top by a horizontal-strip tachometer. The space beneath the tach contains a digital speedometer and legible vehicle-information display. Accessory controls are well placed on the doors, dash, and steering-wheel arms. Inputting audio presets on the new display touchscreen was fairly direct. Climate-system controls are on a long bank push buttons below touchscreen, with repetitive-motion toggles to set temperatures. Middle-row occupants have their own control panel in the ceiling above the right-side sliding door. There is a deep cargo well behind the third-row seats that can haul a lot of stuff. When they’re raised, the third-row seats’ headrests partially obstruct the view straight back. The Odyssey doesn’t offer a power-folding third row, but the manual folding process is quick and easy for the average adult. Personal storage is another strength of the Odyssey. Front doors have two flights of storage pockets. The glove box is generously sized, and there is a deep console box under a sliding cover. What it lacks in length is leavened by a pull-out drawer in the forward part of the console. A sizeable “purse porch” rests on the floor ahead of the console. Long door pockets with bottle holders are found in the sliding side doors. Four exposed cup holders are set into the console, the rearmost pair for the use of second-row riders. The sidewalls contain cup holders and entertainment-system headphone-jack inputs for third-row passengers. The rearmost seats fold flat into the floor to create a sizeable cargo area. An easy pull on a handgrip and a quick tug of a cord raise the 60/40-split rear seats from their well in the floor. 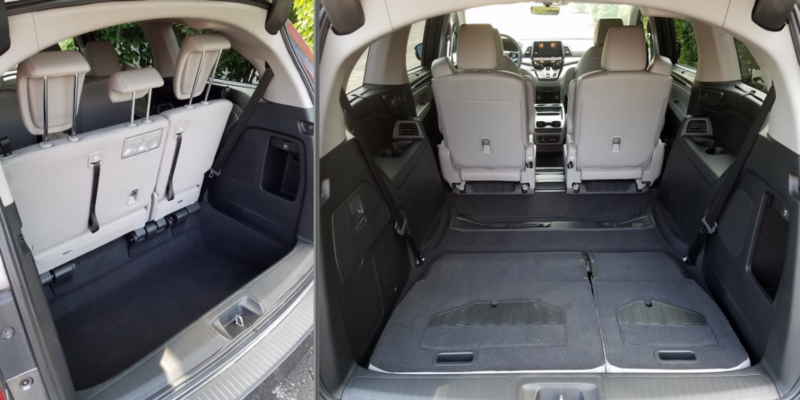 Naturally, cargo capacity is limited with all seats in place, but the exposed depression in the floor does help make the most of what space remains. The hands-free tailgate is supposed to be convenient, but once again with such devices this tester was doing the hokey-pokey for all he was worth for what seemed like a long time (it would have been interminable in the rain) before the sensor recognized his foot and opened automatically. The Odyssey continues to be powered by a 3.5-liter V6, but now it generates 280 horsepower, a considerable gain of 32 from the prior model. With the smoothly efficient 10-speed transmission reserved for the Touring and Elite this hardly is a staid people-mover. This driver was surprised a couple of times by a standing-start chirp from the front tires, and expressway passing power was never in doubt. His 176.3-mile test stint with 66 percent city-type driving resulted in 20.75 mpg, a number solidly better than the 19 mpg the EPA estimates this powerteam should get in the city. On the road, there’s nothing flabby about the Odyssey’s handling—certainly by minivan standards. Even with the Elite’s unique 19-inch alloy-wheel/tire package, bump absorption was good for a quiet, pleasant ride. That is the 2018 Honda Odyssey Elite in a nutshell. I don’t know about you, but I’m feeling stuffed. 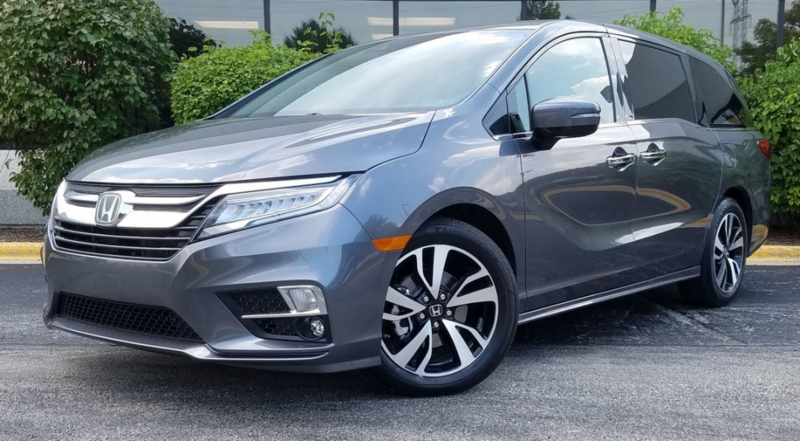 You’ll pay for all of its bells and whistles, but the 2018 Honda Odyssey Elite boasts a very nicely finished cabin, a plethora of family-friendly features, and surprisingly dynamic driving manners for a large family hauler. Written by: The Daily Drive staff on September 14, 2017.on September 15, 2017.